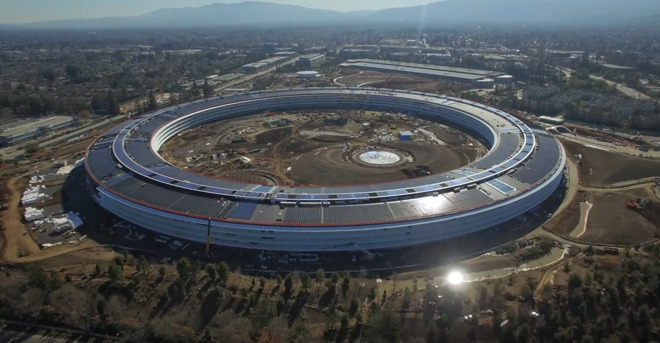 By now, we all know that Apple's "feat of engineering" new campus, dubbed Apple Park, resembles a spaceship, and what better way to keep track of its progress than with drone footage? MacRumors reports that drone videographer, Matthew Roberts, has uploaded a new video to his YouTube channel yesterday, which has been covering the ongoing construction at the new campus in Cupertino. Despite being close to completion, the building still isn't quite ready yet to open its doors to the company's employees. However, construction has picked up rapidly in recent weeks, and the latest footage shows solar panel installation on the roof nearly complete, with large amounts of construction still going on in the main courtyard due to the large pond and neighboring fauna still being added. Landscaping is due to continue well into the summer, even after employees move into the main building. Some buildings are complete, such as the parking garage, but many still have a long way to go such as the campus' new auditorium, dubbed "Steve Jobs Theater."